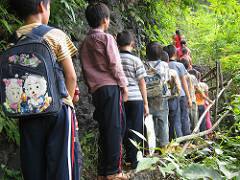 In December 2011 our Rotarians and a team of Rotaractors visited our school projects in Du’An County. In particular we wished to see the completion of the new bridge which we have helped the people to build. The bridge is to provide a route for the children to return to their homes and save hours of journeying around the mountains. The Old bridge is old and unsafe. Below we see the the video our PP Ip Pui Fai has taken with his iPad, not bad for a Rotarian who confesses to be computer illiterate. We will be visiting Guangxi again with our Rotaractos on 26th ~ 29th December. We will visit 3 primary schools, 1 middle school and visit villagers this year. Together with our Rotaractors, we will give students clothings and shoes, biscuits and sweets, eggs for their lunch and we will have lunch with students at the schools. We will also bring bottles of cooking oil when visiting the villagers. We are planning to visit 50 families. The Rotaractors will go there by coach and there are 5 seats reserved for Rotarians. Choi and Fatima will take the coach and Kazu will go by air as he cannot take a 12 hours ride in a coach. Those who would like to join, please let me know asap. Please find attached the picture of the footbridge we did earlier for the students there. The bridge bears our name, the Rotary Club of Macau in Chinese. We see one of the primary schools visited where in our first trips the pupils suffered much hardship, now they have shoes and uniforms and are in better dormitories. Many progress to the Middle School where several thousand receive a full education. This school has been largely build with the donations of Rotarians and supporters and bears the name Rotary International Experimental Middle School for the Ethnic Minorities. GuanXi 2011 from RCM Librarian on Vimeo.